How much compound interest you can earn from a deposit? How much compound interest you have to pay for a loan? This free Compound Interest Calculator is developed to help you to find an answer to the above questions. Compound interest arises when interest is calculated not only on the initial principal but also the accumulated interest of prior periods. This addition of interest to the principal is called compounding. The banks could have your loan's or deposit's interest compounded yearly, monthly, or daily. This free Compound Interest Calculator can estimate yearly, monthly, fortnightly, weekly, and daily compounding. You can use it for both loan (debt) and deposit, for example, personal loan, or term deposit. When you use it as a loan compound interest calculator, it calculates Total Repayment, Total Interest Paid, Total Compounded Rate, & Effective Annual Rate. When you use it as a term deposit compound interest calculator, it estimates Maturity Amount, Total Interest Earned, Yield to Maturity, & Effective Annual Yield. Here is a screen shot that will give you a better idea that what you need to do and how this free Compound Interest Calculator can help you. 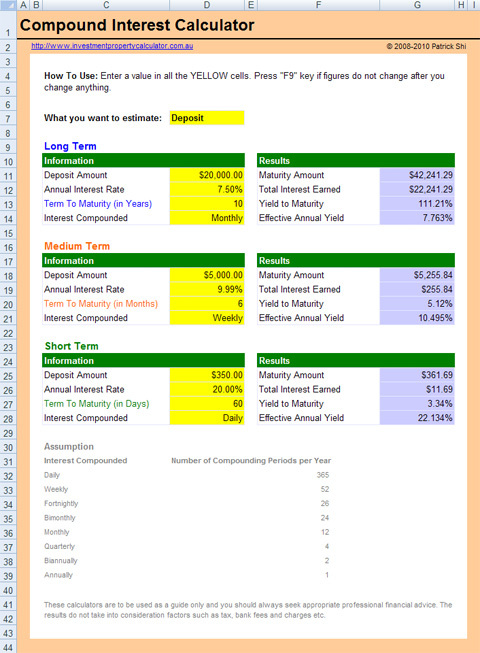 Download FREE Compound Interest Calculator Now! Although you can find lots of Excel compound interest calculator spreadsheets on the Internet, I am confident this is the best and easiest one to use. If you think there is anything I can do to improve this free Compound Interest Calculator, please let me know.